Windfall Arts by Rachel Miller | Pottery, making, growing, loving. I’m filling up my shop! More to come; new things every week. “Make it from scratch!” is my modus operandi for almost everything. I ask, can it be cooked, sewn, written, built, or otherwise fabricated by means within my power, and if so, will it be better than something I could buy ready-made? The answer to both questions is often “yes” (read this as an insult to most mass-made objects, not me bragging about my skills). I often sacrifice extra time to make my own whatever. Is it any surprise that sometimes life is really hard? I feel like I’m starting from scratch, from the bottom, in my studio again. According to my image of myself, this should be exactly what I want–but it seems that through not working for a time, I made more work for myself. Still with two-year old clay on them! Some of my newest “old” pots awaiting glazes. For one thing, it’s a new studio in a new house. For another, it’s been over two years since I made anything out of clay. The time between then and now has been so full of good things, but also many heartaches, and just plain crazy normal life stuff. I don’t feel bad about the time elapsed, and don’t necessarily mourn the loss of the pottery I could have made during it. It’s a season that had to pass in the way it did, and I’m grateful for the relief of having had one less thing going on. In this new, and possibly brighter, season of my life, I am starting over. I’ve found all my pottery supplies and tools and set up shop. Every time I work in here things fall into place a little better. Some things are weird: I have no sink yet (we have to install one), there is almost no natural light (my previous home studios were well-supplied with large windows), and all my beautiful moist clay dried up and molded (come on!). My muscle memory has not yet reminded me which tools I liked best and how to use them. Glazing notes to slip into pots and make glazing more efficient. This squooshy clay will be wrapped up and slowly dried until pliable. For now, I can use a bucket of water, dream of brighter days and new lighting, and soak, chop up, soak again, let dry, and re-knead that old clay into usable condition (just as much hard work as it sounds like). And just keep working until I get it back, whatever it is that tells my hands how to hold tools and move gracefully to form that darn clay. It’s a small life. Days are long sometimes, yet there is so little time . . . but lots happens anyway. I’ve put my Etsy shop on vacation until the holiday season. Keeping up with all the things has just proved to be too much for me. I’m sticking to some simple goals: make a few pots every week, have some nice new things by the fall, and post them on Etsy starting in October. It looks like Windfall Arts will be a more seasonal venture for me while I have a little one. And that’s okay with me (although this has not come without tears). Life needs time for other things. For putting up apple butter after a gift of summer-fallen fruit, for making pesto from the buckets of basil you planted, for knitting something beautiful for yourself or a friend. Most of all, for reading book after book after book (not necessarily different ones) to the little one who brings them to you and climbs up on your lap, for walking to the park, for putting the high chair in the open patio doorway and feeling the breeze, for watering the garden and accidentally spraying the little one who really really wants you to, for making funny faces and hearing that little laugh bubble up again and again, for feeling what this new love does to your heart. I realize over and over why I can’t keep my business going full-time. The art will (mostly) wait, but this is going so fast. So very fast. As you might know if you’ve seen my recent posts on facebook, I’ve got some new things in the works. There is great excitement here in my messy little studio. I feel grateful and triumphant in a couple of different ways. To be making things at all is a huge victory over all the distractions, both inherent to life and created by me. (Credit here must go to my husband for cooking and watching a toddler at the same time so I can work.) To be making different things than I was making pre-baby, fewer of them so that I can take the time to make them really wonderful: this is refreshing and life-giving. And it’s always fun to have new stuff. It should be mentioned that these are process photos—pots in raw clay form (in this case porcelain), the photos usually taken right when I’ve put the finishing touches to them and am most excited. They still need to dry out, then be fired, glazed, and fired again. I have noticed something about myself—I love having a finished product. Much of my happiness in creating objects in assorted media is in seeing them completed, and in a sense having checked them off a list (I am a list-maker). It’s not that I don’t enjoy the processes; I just like getting things done, and I like having them. But pottery is an exception to some degree. The process is very satisfying; each stage is a tiny completion in itself. The whole span from lump of clay to finished, glass-coated piece is long—but it comes in nice meaty sections, each of which has its own inherent creative decisions and start-to-finish nothing-to-something satisfactions. And then when you get that piece back, out of the kiln, you turn it around in your hands and see all the facets that you did and didn’t expect. You see how each of the processes, fluid or exact—knead, throw, build, carve, stamp, add handles, smooth, twist, stretch, dry, fire, glaze, fire—have layered and melded together, laboring to make this condensed and hardened final beautiful thing. Some of it you did, by skill or by some serendipitous movement of hand, and some of it was done for you by the unknowable chemistry of the kiln. Some of it is what you knew you wanted all along, and some of it is new and lovely. So there is grace and gratefulness, as well as that tiny happy pride. Getting to use the finished piece doesn’t hurt either, especially if it holds coffee. And speaking of being finished, I’ll start glazing and firing these up in September. Pictures to follow. It’s not original at all, not very complicated nor requiring much creative power to make it work. I’ve seen plenty of other artists use plant impressions in their pieces. But I’m not too worried about being a pathfinder or trailblazer right now, just about trying something new-for-me that I will love and that will expand my sense of the possible. 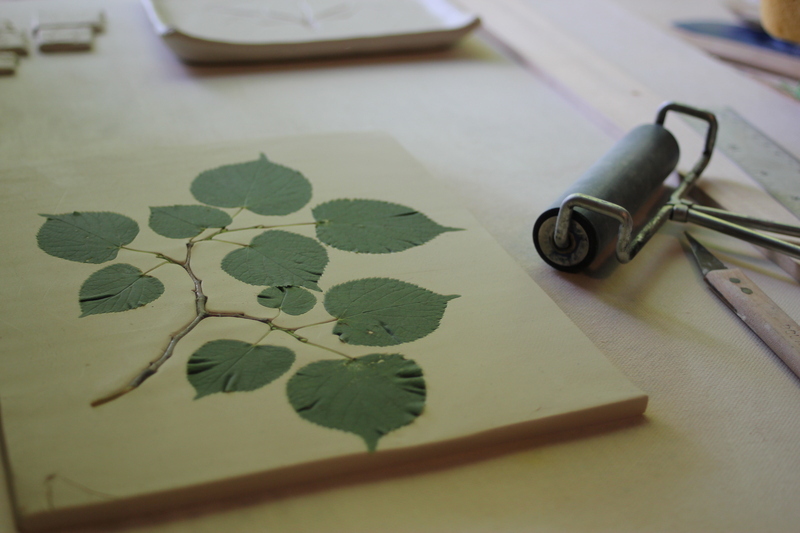 And who needs edgy or boundary-pushing when the print of a leaf is so delicate and alive? I can’t go outside without seeing some shape, some quiver of branch, some whorled bud or seed that is a complete revelation, a complete beauty in itself, though I may have known and noted the plant before. All is old. All is new. Something of freshness in every rendering of a time-honored theme. We are like little magpies these days, collecting color and taste and texture for our book of life. Reading and strawberry picking and seven-foot tomato plants. Coffee and jam-making and homemade swimming pools. Having close church friends over for a vehement yet unheated discussion. These are the people we are—trading food and stories with the neighbors, exulting in the unseasonably cool weather, not quite finding time for All The Things—some of who we want to be; some of the longing for what we wish to come. All this beauty and also difficulty. Trying to be good to each other, succeeding then failing and asking for grace again, knowing this is how it always will be, world without end. Feeling God’s love filter down to us through the mesh of hardness we put around ourselves, reaching us anyway, reaching this little one too. Salt and sweet, hard yet beautiful life. Things have come up nicely. This is our 4th year of growing edibles (2nd year of raised beds and not just pots), and work and patience are starting to pay off! So far we have radishes, arugula, 2 kales, some scattered peas for snacking on, and lots of herbs. It’s enough for now. Besides that, toddlers are notorious garden pests.